When you compare atvs and other powersports, what exactly are you looking for? We can compare ATVs, political parties, religion, you name it. The saying goes: "You can please some of the people, all of the time, and all of the people, some of the time, but you can't please all of the people, all of the time". Or something like that! But it's true. Some people will do anything to find a fault in everything. Some people want everything their way all of the time. For those people, I'm probably wasting my time writing this. On the other side of the coin, there's open minded people. People who accept change and will try new things. Now I'm not a philosopher by any means, but the latter group will appreciate this article as I try to fairly compare. Let's begin with what we're familiar with. The Japanese have built some machines that have stood the test of time. From the old 3 wheelers to todays Mega cc 4 wheelers. As I compare ATVs, I can't deny the impact that the Japanese have made. And I'm not trying to do that. I believe "the big three" manufacturers make some impressive ATVs. This website, after all, is not meant to knock them. But there was a time when they too were unknown. One main problem with the Japanese brands is cost. I once sold a china made dirt bike for $750. The guy wrecked it into a tree. He brought it to me to repair the damage. Along with a few other items, I noticed the rear shock was broken. I did'nt have the shock in stock and told him that I could get it in a couple of days. He wanted it faster. So I went to a local Kawasaki dealer to pick up a shock that would fit. The cost? $450. The Japanese made shock was nearly 2/3 the price of the entire china made bike. Needless to say, he waited a couple of days. So my point is that not only are the ATVs expensive, but parts and labor charges are pricey as well. As we compare ATVS, I'm reminded of one more story. My cousin bought a brand new Japanese atv for his daughter about 4 years ago. He paid $2500 for this 90cc ATV. After a year, she did'nt ride it anymore. After sitting idle for another year, he put it up for sale. And it sat. And it stayed. And he waited. His price was $1800. He was taking a $700 loss. Why would'nt it sell? Well, and I'm just guessing, but who would pay $1800 for a used Kids ATV when they can get a new one for less than half the cost. It's a funny thing about kids. They outgrow things. Mentally and physically, they get bored and want more. Actually, it's not funny. Some adults are the same way! But I'm not going to try to convince an adult that he does'nt need an 800cc full time 4WD ATV with fuel injection and power steering. $10,000 toys like that are great if you can afford them. But some people don't need that. And kids don't need that. And if you don't need it, then should'nt there be an alternative that can meet our budget and needs? If a kid is going to destroy it, outgrow it, or get tired of it anyway, should'nt we buy one that we can pass down or resell to recoup most of our hard earned money? To be fair while I compare ATVs and other powersports, I'll sidebar here for a second. 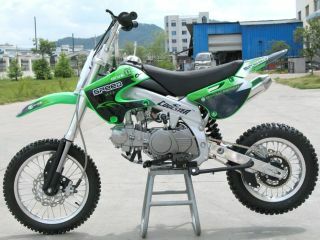 Here is the Kawasaki KLX 125. Here are the specs for it that I pulled off of their website. Engine- single cylinder, air cooled Bore x stroke- 57.0 x 48.8mm Compression ratio- 9.5:1 CDI ignition Length - 72" Width- 30" Height- 41.7" Clearance- 10.2" weight- 176lbs. 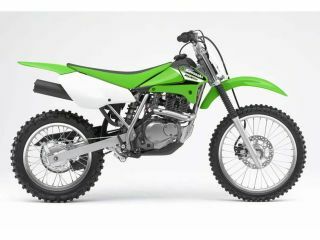 Now here are the specs for the Coolster 214F jumper 125cc taken off of their website. Engine- single cylinder, air cooled Bore x stroke- 52.4 x 55.5mm Compression ratio- 9.0:1 CDI ignition Length - 63" Width - 18" Height - 41.7" Weight - 165lbs. Now, I'm not trying to pick out any one comparison here. But as I compare ATVs and other powersports, I thought I'd throw a spec sheet in for extra insight. The benefite from the China made brands go further than affordable machines and parts. Many of the ATVs have safety and other convenience features that you can't get on other brands. I sell a China made motorcycle, for example, that comes standard with a sissy bar, crash bars, winsheild, saddle bags and foot boards. It is also chromed out. All of these "extras" would add up to alot more money if your Japanese bike did'nt come with them. And the warranty on that bike? The same as the Japanese. The price is about $700 less however! Safety features like pull stops and remote shut offs are now standard on most all China ATVs. And how about size. The China brands offer a huge size selection to fit the smallest riders to adults. Again, I am not here to bash anyone. I beleive that they both have a place and target audience. Your budget may not allow you to spend a small fortune on an off-road leisure vehicle. On the other hand, you may not mind spending more to buy something your familiar with. Either way is fine. It's obvious that China has stole quite a bit of the Japanese ATV market. They won't take it all. They both have a place here.